Posted by Stuart Herbert on March 29th, 2007 in News, Shoot. As a bit of an experiment, I’ve added a new link to the bottom of each photo of my walk along the route of the Melingriffith Feeder. When you click on the link, Google Earth will open up and will take you to where the photo was taken. You’ll need to have Google Earth installed, and if prompted what to do with the KML file, tell your browser to always open the file using Google Earth. This uses the FlickrFly service. Posted by Stuart Herbert on March 28th, 2007 in News. I’ve updated the Merthyr Road project page to include a list of planned articles too, so that you can see what’s going to be coming up over the coming weeks. There’s only time each week to publish one article in the set, but I normally find myself coming back from each trip out with photos for two or three articles at a time. I guess it’s one of the advantages of how all the routes between Cardiff and Merthyr – historical and modern – are intertwined. The original plan was to spend just one year – the whole of 2007 – on the Merthyr Road project. With the photos I’ve already taken this year, I have enough material today to publish articles right the way through to August. Maybe things will change as the year draws to a close, but today it’s looking like the Merthyr Road project will take up a good chunk of 2008 too. Posted by Stuart Herbert on March 28th, 2007 in Equipment. 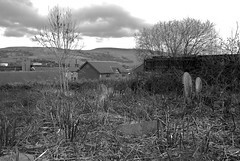 My Merthyr Road photography project can see me walk 6 or 7 miles a day on weekends, travelling parts of the route between Cardiff and Merthyr Tydfil in South Wales taking a closer look at the many interesting things that are easily missed when you go whizzing by in a car. Lugging a camera bag full of different lenses has quickly become a drag, as has stopping to change lenses. For most of March, I tried going about with just the one lens – my trusty Sigma 15-30mm. It’s a great lens (so long as the sun is behind me! ), and in the four years or so that I’ve owned it, I’ve taken many pictures with it that I’ve been very happy with. I bought the lens whilst on holiday in Snowdonia with my Nikon D100 back in 2003. It was the first time I’d been on holiday with a digital SLR, and I learned the hard way that none of my existing lenses gave me anything approaching a “wide” image, because of the 1.5x focal length multiplying effect. I dragged my poor wife around North Wales, looking for a camera shop, just so that I could take this shot of Dolbadarn Castle in the Llanberis Pass at the foot of Mt. Snowdon. Whilst 15mm has been handy to have, I’ve found that only having 30mm on the zoom end is very restrictive when I’ve been carrying only the one lens. So, fed up with the situation, I decided to trawl through the Nikon SLR Lens Talk forum on Digital Photography Review, as well as the reviews on SLRGear.com, to find myself a single walkabout lens. I’ve settled on Nikon’s 18-135mm DX lens, which is the standard kit lens for the Nikon D80 SLR. When attached to a digital SLR such as my Nikon D200, it’s the equivalent of a 27-200mm lens on a full-frame 35mm SLR. It doesn’t have the advertised reach of the Nikon 18-200mm lens, nor the built-in VR-II image stabilisation technology, but unlike the 18-200mm lens at least you can buy one today. There are plenty of folks online who report that both the 18-135mm DX lens and the 18-70mm DX lens (the kit lens from the Nikon D70) produce images with exceptional sharpness – much better than the 18-200mm lens. Some folks prefer the 18-70mm lens because it has a slightly faster aperture at the zoom end, or because it has a metal lens mount ring (the 18-135mm DX lens has a plastic mount ring), or because it has a rubber weather seal (which I must admit appeals to me!). Folks who prefer the 18-135mm DX lens online all seem to focus on the extra convenience of having that extra reach on the zoom – which is exactly what I wanted from my next lens. I’ve used this lens on three shoots so far, including half of the images from my shoot at Melingriffith (the other two shoots will be published later in the year). Despite a concern about the build quality, which I’ll come onto in a moment, overall I’m very happy with the new lens, and it certainly fits my need of having a single lens I can use for walkabouts. I’m extremely pleased with the sharpness, colour and contrast of the images I’ve taken so far – three areas where I had no complaints about the Sigma 15-30mm lens that this replaces. The only problem I’ve had with the lens has been with the focus ring. This year I’ve started shooting nearly all my shots using manual focus instead of relying on the D200’s excellent automatic focus system. The majority of my lenses are made my Sigma, and if there’s one thing that Sigma have consistently gotten right on their lenses, it’s the working of the manual focus ring. On Sigma lenses, the focus ring is always nice and tight, and as you get towards the infinity end of the focus range, it certainly feels like it takes more movement of the focus ring to adjust the focus – giving me the feeling of a very precise control. Unfortunately, the focus ring on my new Nikon lens is very loose. All I have to do is touch it and the focus shifts substantially, and I’ve found that I’d often knock the focus off just by catching the focus ring against my hand when raising the camera to my eye. I’ve gotten used to it, but I don’t like it, and I’m debating giving Nikon a call to see whether they will adjust the tightness of the focus ring for free or not. There are plenty of other lenses in this range that would also make good walkabout lenses. As well as Nikon’s impossible-to-find 18-200mm lens, Sigma has lauched an 18-200mm lens with built-in optical stabilisation, and both Sigma and Tamron sell lenses in the 18-70mm range too. I chose the Nikon lens because of the exceptional rating for image quality – and so far it’s proving to be a good choice for me. Posted by Stuart Herbert on March 28th, 2007 in Glamorganshire Canal, Historical, Melingriffith, Melingriffith Feeder, Merthyr Road, Pentyrch and Melingriffith Light Railway, River Taff, Shoot, Taff Trail, Tin Works, Walking Routes. View the photos from this shoot as part of my Merthyr Road collection on Flickr. When it came to working tin in South Wales, Treforrest was the undisputed King. But if Treforrest was King, further south down in the Vale of Glamorgan above Cardiff, the works at Melingriffith were certainly the Crown Prince. Built in 1749, the Melingriffith Tinplate Works sat on or near the site of an old corn mill that had existed as far back as the twelfth century. It was once the largest tin works in the UK, until the construction of the Treforrest Tin Works. The works closed in 1957, and today the only obvious traces that the works ever existed at all are the Melingriffith Feeder that runs down from the River Taff, and the restored Water Pump standing opposite Oak Cottage. The works themselves appear to have been completely cleared, and the site today is a modern housing estate. Its mills were powered by water taken from the River Taff by the Melingriffith Feeder – a water course that doubled as a canal carrying iron from Pentrych Works until around 1815, when the Pentrych tramroad was completed. The tramroad crossed the River Taff over Iron Bridge. The Feeder lock was permanently closed in 1871 when it was bridged over, but traces of it remain if you don’t mind walking out into the (mostly) dry bed of the Feeder to look. The Melingriffith Feeder makes its way to the old Glamorganshire Canal, where they run in parallel down to the Tin Works and out the other side at Melingriffith Lock. 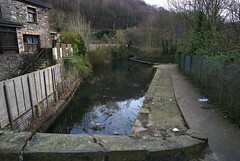 Where they come together to the north of the Tin Works, any overflow from the Canal was designed to flow into the Feeder. This is now the southern end of the Glamorganshire Canal Local Nature Reserve at Forest Farm, and all the water from the Canal now runs into the Feeder before disappearing into a water course that runs underneath the housing estate that has replaced the Tin Works. At the southern end of the housing estate, the Feeder re-emerges from underground where the Melingriffith Water Pump stands. The Pump was originally designed to pump water from the Feeder into the Canal at Melingriffith Lock. Rowson & Wright’s “The Glamorganshire and Aberdare Canals Volume II” has an entire chapter devoted to the many disputes between the Tin Works and the Canal over the supply of water. As I understand it, the Tin Works ran entirely on water throughout its history – water that the Canal itself also needed, as Melingriffith was the last point where the Canal could gather additional water needed for the section down to Sea Lock. Today, the Canal has been totally obliterated (Ty Mawr Road has replaced the Canal here down into Whitchurch), and the Feeder just empties back into the Taff beside the Valley Lines railway bridge just south of Radyr Station. Melingriffith is a great example of the huge contrast that exists between Cardiff and the Taff Vale in the regeneration of the former industrial sites. Most of the route of the Canal through Cardiff was industrialised, but today you wouldn’t know it. The Canal has gone, and the industry has been replaced by the housing estates of Melingriffith, Gabalfa, and Talybont, plus the regeneration of Cardiff Bay. 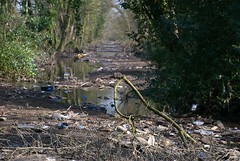 In the Taff Vale, the Canal has mostly disappeared under the A470 trunk road, but where it hasn’t, the land has mostly just been left unused until you reach Rhydycar at Merthyr Tydfil and the site of the local Welsh Assembly Government office. It’s a story that mirrors the growth of Cardiff against the decline of Merthyr. I’d travelled through the Melingriffith housing estate a couple of years ago cycling the Taff Trail, but back then I’d never heard of the Tin Works, or the Feeder, or really of the Canal itself. I’d stopped at the Water Pump, and read the excellent tourist sign that goes with it, but without any background knowledge, I didn’t really understand what I was looking at. I didn’t know that Oak Cottage on the other side of the road was the old lockkeeper’s cottage from Melingriffith Lock, or that the road itself is where Melingriffith Lock once stood. I didn’t know that the Water Pump stands in the Melingriffith Feeder, whose route can be traced back up to the River Taff at Radyr Weir. And I didn’t know that the Feeder was also used as a canal – with its own lock on the River Taff itself – years before the Glamorganshire Canal was constructed. If you want to explore this area for yourself, I recommend parking at the southern end of the Glamorganshire Canal Local Nature Reserve. There’s a small car park there. Head north into the Reserve, cross the Canal overflow bridge, and follow both the Feeder and Canal until the Feeder starts to veer off to the left. Follow the Feeder all the way up to the River Taff. Here you can see the sluice gate mechanism that once regulated the flow of water into the Feeder, and the remains of the lock. Turn south, past Radyr Weir and its picnic area, and follow the Taff Trail down until it threads its way through the Melingriffith housing estate to Oak Cottage and the Water Pump. If you wish, there’s a muddy footpath down the Feeder’s east bankside that you can follow down to the River Taff and beyond, but that’s really a walk for another day. At the Water Pump, turn north, and follow the road (which lies on top of the old canal bed) back up to the car park. The whole walk will take an hour or two, and should be suitable for most people. The Feeder is just one of the delights to explore in this area. There’s the Canal itself, which can be followed up to Longwood Drive (and further north up to Tongwynlais, as covered in another article). From Longwood Drive, there’s the disused Cardiff Railway route down to Coryton, which also makes for a great walk. And all of these walks are set in the Local Nature Reserve, which includes two purpose-built hides for watching the local wildlife without disturbing it. From the two visits I made to Melingriffith, I came away with 305 photos, according to Aperture. Even allowing for the fact I now bracket every shot (so, divide that number by 3), that’s still a lot of photos. It was a tough challenge cutting it down to the 26 photos I finally uploaded to Flickr. Picking just one photo as a favourite was harder still. In the end, this photo showing the Glamorganshire Canal flowing down into the Melingriffith Feeder is my favourite photo from this shoot. It’s a photo that’s a bit different, for a start. I’m willing to wager there aren’t too many other shots of this scene currently around 🙂 I love the colours too. I think it’s a great advert for what my new Nikon 18-135mm lens can do (more on that lens in a dedicated article later in the year). The photos for this shoot come from two separate visits to the area. Because you have the Canal, the Cardiff Railway, the River Taff and the Taff Trail all in the same area, some of the shots are going to be included in other shoots in the future. Rather than lump all these shots into a single folder, I decided to spend a lot of Mother’s Day tagging my photos in Aperture, with a view to building a set of Smart Albums based on the tags. Aperture is a great tool, but if there’s one thing that Apple has overlooked, it’s the very simple operation of being able to add one keyword to a group of selected photos. I can use the excellent Lift & Stamp tool to copy keywords from one photo to others, but I can’t drag and drop a keyword onto a group of selected photos. When you try, the keyword gets applied to just one photo in the selection (the photo that you drop the keyword onto). It would be such a time-saver to be able to do this simple task – it would save me up to an hour a week. A search for the term ‘melingriffith’ turned up two great shots of the Water Pump, but no shots of the Feeder at all, and no old photographs showing the Tin Works during their existence. Maybe my search foo just isn’t good enough. I’m really surprised that there aren’t more photos up on Flickr covering the same subjects as my articles. These places are part of the Welsh heritage, as well as being historically important both to Wales and the UK. Posted by Stuart Herbert on March 18th, 2007 in Technique. First off, just a disclaimer before I go any further. I don’t want anyone thinking I’m something that I’m not 🙂 I’m very definitely an amateur photographer. I’ve had no formal training, and I’m certainly not qualified to teach photography. If you want to know how things “should be done”, so to speak, then enroll on a course. I’m sure that there’ll be plenty of suitable night courses in your area, and, of course, there is always Amateur Photographer’s home study course. Or, you could pick up a good book by a real expert. I always recommend Michael Langford’s Basic Photography. What I’m talking about here in these Technique posts are how I work with the camera, and what works for me. If you’re okay with that, then read on! A camera’s automatic mode is exactly what it sounds like: you point the camera at what you want to photograph, and the camera makes all the other decisions for you. Most compact digital cameras only have an automatic mode. Larger digital SLRs all come with automatic modes, as well as the ability for you to take more control should you wish. SLRs have built in databases of many thousands of photographic scenes, and it’s often said that SLRs can make better decisions than many photographers. Using automatic mode is point-and-shoot photography. And there’s nothing wrong with it. Don’t think for a minute that you’re not a “real photographer” just because you currently use automatic mode. I don’t even know what a “real photographer” is, or why anyone would want to be one. If you’re taking photos on automatic mode, and you’re happy with the results, then be happy. What Does Automatic Mode Do? It controls the size of the iris (photographers call this the aperture) in the camera lens. The iris controls the amount of light that the camera sees, and has the side effect of controlling the angle that the light hits your camera’s sensor. It also controls how long (in time) that the camera sees the light from the lens. There is a blackout screen inside the camera called the shutter. When the shutter is open, your camera sees light. The longer the shutter is open, the longer your camera sees the light. A well-exposed shot is a combination of balancing the aperture size against the shutter speed. As the aperture size gets smaller, the camera needs to see more light (the shutter needs to be open longer) in order to get enough light to create a photograph. Equally, the longer the shutter is open, the smaller the aperture needs to be to prevent too much light ruining the photograph. It’s a balancing act between the two. A lot of the art in photography comes from taking control of one (or both) of these key decisions from the camera, and putting that control into your own hands. Automatic mode – where the camera controls both shutter speed and aperture size. Aperture priority mode – where you control the aperture size, and the camera controls the shutter speed. Shutter priority mode – where you control the shutter speed, and the camera controls the aperture size. So-called “consumer” level SLRs also often come with additional automatic modes for landscape, portraits, sports, night photography, and so on. My camera of choice – the Nikon D200 – does not include these modes, and I won’t mention them any further here. Most of the people I know want to move away from automatic mode because they somehow feel that they are “cheating” by letting the camera make the decisions. Well, I’ve never yet met a camera that decided what it should shoot and when. A camera is a tool in the hands of a human photographer, simple as that. You’re already making many important decisions, even if you don’t realise it. If you’re getting photos that you like, then don’t worry about it. You’re not cheating. The right reason to move away from automatic mode is to take more creative control over your photography. When I first began taking photos, my friend Hugh had me start with aperture-priority mode. Although I personally shoot mostly in shutter-priority mode today, the majority of fellow amateur photographers that I’ve spoken to prefer aperture-priority mode. By controlling the aperture size, you take control over the depth of field that can be seen in the final photograph. The depth of field is the term that photographers use to describe the area of your picture that is in focus. If you imagine that the item you’re focusing on is slap bang in the middle of the depth of field, then the depth of field extends in a straight line from there towards your camera, and also from there away from your camera. Items outside the depth of field appear blurred in the final photograph. A larger aperture (such as F/2.8 – F/6.3) creates a smaller depth of field (photographers call this a shallow depth of field). The depth of field only extends a short distance either side of the area of your picture that is in focus (photographers call this area the focal point). This allows you to deliberately blur things like the background of a photograph, allowing the main subject to stand out a lot more than it would otherwise. A smaller aperture (such as F/11 – F/22) creates a larger depth of field. The depth of field extends a longer distance in front of (and behind) the focal point of your picture. This allows your picture to include detail not just from the main subject, but also from whatever is around it too. Larger depths of field are particularly useful for landscape photographers looking to capture as much of the landscape as they can see. As a rule of thumb, I find that an aperture size of F/5.6 creates a depth of field (very) roughly like what the human eye sees when looking at something up to 10 metres or so away, and F/11 creates a depth of field (very) roughly like what the human eye sees when looking at distance objects such as a wonderful landscape view. Don’t Forget The Balancing Act! In aperture-priority mode, the camera automatically adjusts the shutter speed for you, using information from the built-in light meter to ensure that your photograph is correctly exposed. As you change the aperture, the camera changes the shutter speed. If the shutter speed gets too low, then the photograph you take will be blurred. The blurring happens because we are holding the camera, and we can’t hold the camera absolutely still. One way to solve this problem is to always use a tripod. Even the best tripods are cumbersome, have to be carried about, and the whole rigmarole of setting up the tripod just to take one photo can kill the fun of amateur photography. Another option is to make sure that the shutter speed is always high enough for shooting hand-held. As a rule of thumb, I never shoot hand-held at a speed of less than 1/80 – that’s one eightieth of a second. With lenses zoomed in more than 80mm, the minimum speed goes up accordingly – so, at 400mm zoom, I’m looking for a speed of 1/400. It’s not always sunny enough to get that sort of speed, which is where lenses with built-in image stabilisation start to become very useful! At first, you’ll probably forget to check your shutter speed, and end up with quite a few blurred photos. Don’t worry about it! Keep practising, and it will stick in the end. Until it does, you have the advantage that you’re shooting digitally. Just imagine what it was like when I started photography shooting on chemical film. Digital makes it much easier to practice new techniques over and over until you’re comfortable with them. As mentioned above, I shoot mostly in shutter-priority mode these days. I combine that with the Nikon D200’s extremely handy auto-ISO mode to get as many sharp images as I’m able to. In my next technique article, I’ll talk about my one and only wedding shoot that I did back in 2003, and why the next feature you need to master on your digital SLR is digital’s unique ability to change the ISO setting between each shot.